I knew this one would be good. Chicken Pizza. Gooey cheese. Hot, crispy crust. What's not to like? What I didn't expect was that this would be *so* good. I figured I'd make this once and probably never make this exact recipe again. How wrong can I be? A simple collection of ingredients -- red onions, chicken, mushrooms, red peppers. Nothing special on their own but together ... mmmmmm! I think the key is that you saute the vegetables and chicken before adding it to the pizza. I was afraid it would be a tad bland without sauce but it was perfect. So much so that I've already eaten the leftovers for lunch today and I have to say it held up remarkably well. 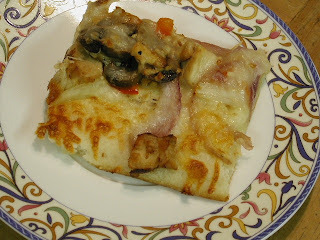 A few minutes in the toaster oven and the crust was crisp and the toppings still flavorful. A quick and easy hit that probably took less than 20 minutes to make. This one is definitely going to be in the rotation from now on.